Lilandra and I learned to love sushi (separately) while out of T&T. We have yet to convince our family members to try it, but we will endeavour. Sushi restaurants are fairly recent and rare in Trinidad, so I never tried it until about 3 years ago. I love fish, and apparently can eat it raw! I hear there is another place in Trinidad, but haven’t been. I have been to Hanami in the Movietowne complex, however, 3 times. I think. At least 3. And always with Lilandra and/or friend TB. I like Hanami. The service has always been great, and friendly and I love the decor. If I find a decent pic of the restaurant itself, I will post. 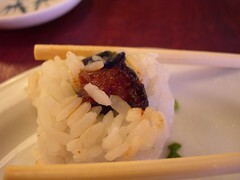 Lilandra has recently expressed the view that it isn’t the greatest sushi, it doesn’t excite her, but it is pretty good. Let’s put it this way, I went to a sushi place in Jamaica where I had a Spicy Eel Roll that was baaaaaad. And something else that I didn’t bother to finish eating. But I have never gone to Hanami and had something that simply didn’t taste good. I may have had better Tuna rolls, but the ones they serve are still enjoyable. California rolls (anything with avocado is great); Spicy Tuna Rolls (not bad); Dido Rolls (rice in hot sauce rolled in salmon – very good, but the salmon should be thinner); Shrimp Tempura Rolls (great-fried shrimp in a sushi roll? what could be bad? also has cucumber and Japanese mayo); Spicy Shrimp Rolls (good); Kyoto Rolls (cream cheese? see avocado comment! ); Veggie Sukiyaki (really delicious and light – like salad on top a broth); Tofu Fingers (blah – they put the tofu in a batter before frying so the tofu itself was bland – I think they used tofu that wasn’t firm enough also); Ice Cream Tempura (ice cream in a crunchy batter deep fried and covered in chocolate sauce – glad I tried it, but a bit too much for me to have often) – think that’s about it for now. Once complaint though – Hanami needs to change their brand of disposable chop sticks – they are too round and don’t taper much to the end, making them less functional. According to Lilandra -aren’t Japanese chopsticks supposed to be tapered to points? These pictures are from an earlier visit to Hanami, where in addition to all that sushi, we tried Japanese tea, veggie sukiyaki (one split into 3) and ice cream tempura! The last time we went, we only managed the sushi rolls above. This entry was written by Chennette and posted on November 24, 2006 at 2:10 pm and filed under food, photos, restaurant, Trinidad and Tobago. Bookmark the permalink. Follow any comments here with the RSS feed for this post. Post a comment or leave a trackback: Trackback URL. Mmm, love sushi. From what I could remember, I’ve had the spicy Tuna rolls, the shrimp tempura rolls and the eel sushi whose name I can’t remember, but is my favourite. I think I’ve had others that I’ve sampled off the plates of friends. The only one I don’t like is the one made from roe….nasty. I can’t get used to the idea of eggs bursting in my mouth. Haven’t tried the roe yet, but intend to. And I have even made a couple sushi rolls in my time. Just can’t find the tools in Trinidad yet. 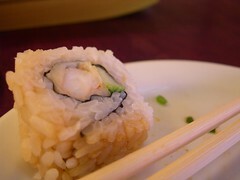 See, I remember some spicy tuna rolls being hot and awesome and to die for! Malabar Farm in Bournes Road in St. James had quite a few things….we went searching when hubby (who was suffering from Sushi withdrawal in Tnt – days befor Hanami etc) bought a Japanese cookbook on that ship that sells books (? )…and HAD TO HAVE ALL the stuff he could find IMMEDIATELY. Chennette, did he never cook Japanese food for you….see how you’re loved, mean mean friend?????? The boat at Hanami is really cool!! No – no japanese food. Although I recall being offered sushi rice when you were clearing out. Well, Lilandra is really the one who wants to make it, she bought herself a book as well, one on Sushi and then later one on Japanese cooking generally since she couldn’t find the sushi tools. Oh yes, why am I mean? A friend yes, but mean??? Who didn’t cook for you? How do I get to Malabar Farms?? SUSHI!! YUMM!! My adoration started with Kulu Kulu in London. Grew with Resturant Japan (JAMAICA) and Hanami (TT). 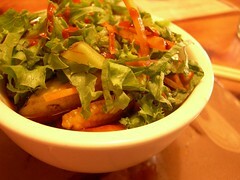 One dish I really enjoy at Hanami is the one with the plaintain. I think it was Magic or Dido, don’t recall.. but um um good!! I’ve had Laughing Buddha which was not bad but the service there was painfully slow condsidering the place was empty. 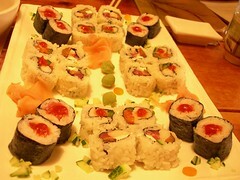 I hear they have sushi on Wednesday night at the Lure in Chagaramas.. but I dunno about the whole sushi sometimes idea. PS. i love cream cheese in my rolls too! YUMM!! @Island Spice – Yay – sushi! I first had sushi when fellow students decided they wanted to make, then at Yo Sushi! in Edinburgh. 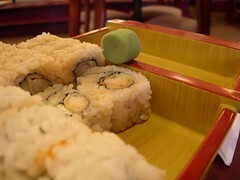 After that I kept wanting to try more, and I did – the raw fish, rice and seaweed…mmm. @Hmmmm – well, then, yes MEAN MEAN friend he is! NO IDIOT SISTER!!!! I can’t drive there. Also directions != address. Wait…YOU ARE TAKING ME! Didn’t you know??? I first had Sushi when I met an internet friend for the first time. Either that or with my roommate but I’m betting internet friend. Hmmmm lives on the North Sea now. Apply deductive reasoning. You know my friends. I missed the part about the North Sea. Yo Sushi in Edinburgh! I was there! I was there! Hawaii had some good sushi, too. chennette: yes I think they should. But I’m tired of not having internet so I disabled the wireless and the imac is connected and i’m connected via super long crossover cable! Gosh! You’re making me hungry you darned chennette lady! welcome and sorry about the hunger! 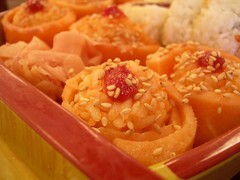 Fantastic blog I enjoyed too much seeing pictures of Japanese dishes in TT. hey. i was googling sushi bars in trinidad and i found this link. is hanami in mt still open? i’ve actually never heard of it. Where in MT is it? Hi and welcome Jamie. I haven’t been in a couple months, but it was at the back of the promenade (?) on your left just before you approach the box office – where the clothing boutiques etc are and next to the outdoor bar in that area. It’s still on their website http://movietowne.com/retail_stores.htm but then, can we trust that information? Someone who is in Trinidad now can advise us perhaps? Dude, personally i cant stand Hanami…thier sushi to me pales in comparison to that @ Benihana. Hell, their rice tastes like its parboiled! Im assuming u havent been to beni, seeing as it wasnt mentioned, i STRONGLY suggest u try it out. Now i’ve heard from many friends that Laughing Bhudda is better, with a larger variety and so on, but i have yet to find out myself…will do so soon however. Well, like I said, it’s not necessarily the greatest, but it’s not awful (in my view of course) but I haven’t been to the other 2 yet. Soon maybe soon. Waiting to hear about Laughing Budda when you go! I have not been to Hanami but I’ve been told that their sushi is ok in comparison to Benihana’s (where I have been several times). I’ve heard dismal reports on Laughing Buddha though. If you do go to Benihana’s, I suggest you try the Peru Roll. A waitress suggested it becuase it was not listed on the menu at the time. It turned out to be a table favourite and a second round was ordered even though we were all stuffed. hi Splitsun, thanks for visiting. And for the recommendations on Benihana. Hi Delicia – thanks for visiting! Hi does anyone know if Hanami moved to another location? they are not at Movie Town anymore and i really loved the ambience there. Hi Naomi – I last visited Hanami in February, so any move would have been very recent. Will check on relocation news and get back to you. Thank you Chenette, looking forward to any news you might come across. Naomi Hanami has moved for sure. The last time I visited was in May and I believe they were in the process of relocating (I hope they’re not closed down **shudders at the thought**. I really enjoyed their sushi. Chenette I’d love to know Hanami’s new location also! I’ve tasted hanami’s, Benihana’s and Laughing Buddha’s and I have to say that Hanami was the best…hands down! Benihana’s sushi tastes ok but there’s not much variety to the rolls. They are all more or less the same give or take 1 ingredient. Hanami has waayyyyy more options. However, they both taste better than Laughing Buddha’s. I also agree with the comment above regarding the service at Laughing Buddha…too slow, and we were the only occupants at the time.